This was originally to be a “repair job”. A client asked me to fix a piece she had worn for many years. As does with most things, it wore out in some places and broke in others. After spending some time with it I spoke with her about simply “re-doing” the pendant, however instead of duplicating the piece, I altered the design. The stones are in the same configuration, an amethyst positioned above the top point of a double terminated Quartz and an opal mounted in the front. The alterations were in the metal. These were simple bands of silver. Replaced with a new design: the setting of the quarts is now a lantern with vines and leaves growing all around it, creating settings for the other stones. The handle of the lantern is again wrapped in vines and leaves. The result is a heavier piece, but used as a pendulum, the extra weight gives it more of a “swing”. Shown here it is mounted on a fresh chain. 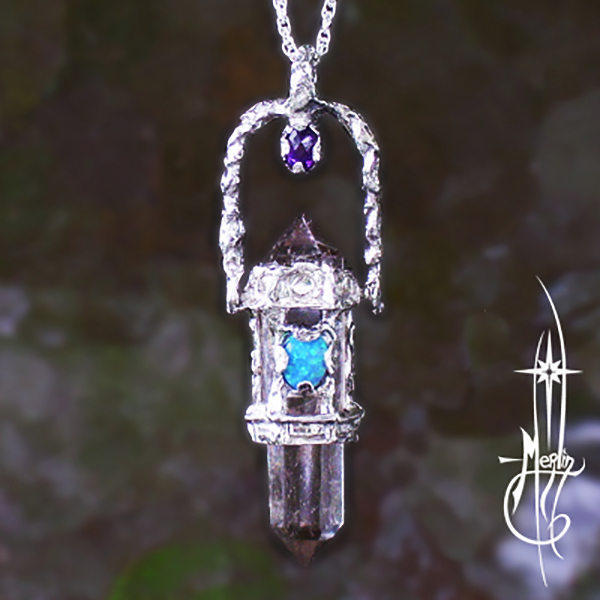 This one of a kind Crystal Lantern now is in a private collection. If you wish to have something unique made for you, please visit my How to order custom page.